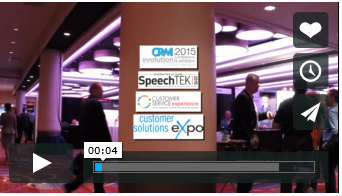 The Customer Solutions Expo combines the CRM Evolution, Customer Service Experience, and SpeechTEK showcases. This central gathering place features the leading sales, marketing, customer service, and speech recognition solutions. The 2016 Customer Solutions Expo is the perfect opportunity to meet with C-level executives, industry pioneers, and the technology gurus who help you do your job better. Monday, May 23, 2016 | 5:00 p.m. - 7:00 p.m.
Tuesday, May 24, 2016 | 10:00 a.m. - 5:30 p.m.
Wednesday, May 25, 2016 | 10:00 a.m. - 1:00 p.m.
Adobe Marketing Cloud is the most comprehensive and integrated marketing solution available, enabling marketers to measure, personalise, and optimise marketing campaigns and digital experiences for optimal marketing performance. With its complete set of solutions, as well as real-time dashboards and a collaborative interface, marketers are able to combine data, insights and digital content to deliver the optimal brand experience to their customers. Apttus drives the vital business process between the buyer’s interest to buy and the realization of revenue. The Apttus Intelligent Cloud maximizes the entire revenue operation by driving behavior and providing prescriptive data to company decision-makers. Apttus offers CPQ, E-Commerce, Contract Management, Renewals, and Revenue Management solutions on CRM platforms. Avtex is a Customer Experience (CX) technology deployment partner that provides professional services and consulting solutions. With CRM being an integral part of a complete CX strategy, Avtex has added Webfortis to provide additional resources, support and customization to further leverage the Microsoft Dynamics CRM platform for our clients to expand and enhance their desire to have unified and intelligent customer engagements. Visitwww.avtex.com. Bullhorn provides cloud-based CRM solutions for relationship-driven businesses. Its zero-click data capture technology and relationship intelligence gives companies what they need, from insight to action, to win new customers and keep them happy. With 600 employees, Bullhorn serves more than 10,000 clients and 350,000 users across 150 countries. Five9 is a leading provider of cloud software for the enterprise contact center market, bringing the power of the cloud to thousands of customers and facilitating approximately three billion customer interactions annually. For more information visit www.five9.com. Infor Customer Experience suite helps organizations integrate customer data, accelerate customer engagement and gain a complete view of their customers. Visit the Infor booth to find out how you can deliver on the promise of an exceptional customer experience throughout the entire customer journey. Microsoft empowers every person and every organization on the planet to achieve more. Microsoft’s CRM solution enables companies to market smarter, sell more effectively and productively, and deliver care everywhere. We provide social insights, business intelligence, and increased productivity with One Microsoft solutions. In the “Age of the Customer” we bridge the gap between businesses and consumers by breaking down barriers of communication and knowledge. We are redefining the digital self-service experience by providing personalized guidance for every consumer at their moment of need, and insights for the business to continuously optimize the digital service journey. Oracle Customer Experience, Only Oracle offers a complete and integrated CRM solution that breaks down silos to deliver a seamless customer experience across marketing, sales, commerce, service, and social. Whether deployed modularly to tackle specific business challenges or deployed as a comprehensive solution, Oracle's integrated solutions take CRM to a whole new level. Salesforce Wave Analytics is designed to help every business user dig into data, make better decisions, and instantly take action. Our sales and service apps make it easier to spot trends and bring data to life, so your whole team can drive smarter sales and create happier customers. SAP Hybris enables businesses to transform how they engage with customers, innovate how they do business, and simplify their technology. Hybris solutions unlock opportunities to optimize your customers’ experience and transform your business. We help you drive relevant, contextual experiences across all of your customer touch-points in real-time, so that you can create strong differentiation and build competitive advantage in the Digital Economy. www.hybris.com. Bpm'online is a premium vendor of process-driven CRM for marketing, sales and service. The beauty and core value of bpm'online products are the out-of-the-box processes that guide users through the most effective actions to accelerate results. CloudCraze delivers robust B2B and B2C eCommerce native on Salesforce. CloudCraze enables clients to deploy mobile storefronts quickly, generate online revenue in weeks, and easily scale for growth. CloudCraze powers eCommerce for Coca-Cola, Avid, Barry-Callebaut, Ecolab, GE, L’Oreal, and Kellogg’s. Conversica provides a unique cloud-based artificial intelligence platform that presents itself as your human sales assistant, who reaches out to every single one of your Internet leads and engages each of them in a human conversation. You sell more, because Conversica's sales assistant contacts and qualifies all your leads first so your salespeople can focus on what they do best...selling. Coveo Intelligent Search helps companies engage customers, upskill employees, succeed at self-service and create high performance contact centers by giving everyone the best information every time, everywhere. Coveo is recognized as a Leader in Enterprise Search by Gartner and leader in search and knowledge discovery by Forrester Research. Higher Logic is an industry leader in cloud-based community platforms, with over 25 million engaged members in more than 200,000 communities. Organizations worldwide use Higher Logic to bring like-minded people all together, by giving their community a home where they can meet, share ideas, answer questions and stay energized. inContact is the cloud contact center software leader, helping organizations around the globe create high quality customer experiences. inContact is 100% focused on the cloud and is the only provider to combine cloud software with an enterprise-class telecommunications network for a complete customer interaction solution. With more than 1,400 deployments globally, inContact has more industry experience than any other contact center cloud vendor. Next Caller has the largest database in the US linking a telephone number and/or email address to customer data. We enrich customer databases with up to 25 data points, enriching SMS marketing and email loyalty campaigns. Our data is also used in the IVR and at the live-agent level to create better customer experiences. Pitney Bowes is a global technology company enabling commerce in the areas of customer information management, location intelligence, customer engagement, shipping and mailing, and global ecommerce. Riva is the leading integration platform for CRM and email systems. Riva integrates the world's best CRMs – Salesforce, Dynamics CRM, SAP C4C, Oracle Sales Cloud, Sugar, NetSuite, and others – with Office 365, Exchange, IBM Notes, Google Apps, and GroupWise. Reliably sync contacts, calendars, tasks, email, opportunities, cases, and custom objects. Thunderhead's intuitive ONE Engagement Hub joins up web, mobile, high street and contact center customer experiences, connecting them with your existing CRM system, giving you a multi-dimensional view of all your customers. It allows you to act on an individual customer's needs in real-time. Effortless engagement just got personal. Trillium Software, a Harte Hanks Company, provides enterprise data quality solutions. We enable better business operations and decisions through complete, accurate, trusted data. Trillium supports traditional enterprise data sources and Big Data, can be easily integrated with applications like CRM, and is deployable on premise or via the cloud. For over 40 years, Aspect has been helping companies deliver better customer experiences. We combine this rich history with a unique vision for the evolution of consumer engagement to reimagine customer service in today’s digital world. Our innovative cloud contact center, self-service and agent solutions are used by enterprises worldwide. For over 30 years, Convergys has provided industry-leading technologies and services that balance customer satisfaction with cost reduction. We combine omnichannel technologies and award-winning Professional Services to deliver effortless, personalized interactions. Our solutions support over 7 billion interactions each year, and 98% of our clients would recommend our solutions. VOZIQ turns contact centers into strategic customer intelligence hubs by applying predictive algorithms and text analytics on customer interaction data, and operationalizing that intelligence to improve customer experience. Our cloud-based solutions have delivered millions of dollars in ROI by reducing customer churn, cutting operational costs, and offering quickest time-to-value. Act-On is a marketing automation company delivering innovation that empowers marketers to do the best work of their careers. Act-On is the only integrated workspace to address the needs of the customer experience, from brand awareness and demand generation, to customer loyalty. With Act-On, marketers can drive better business outcomes. For more than 30 years, ISM has helped best-in-class organizations plan and implement Digital Strategies including CRM/Social CRM, Big Data Analytics, Customer Experience Management and Channel Optimization. ISM founder and president Barton Goldenberg is a popular speaker and author, and an original member of the CRM Hall of Fame. Rimini Street is the leading independent provider of enterprise software support services enabling Siebel CRM licensees to save 50 percent on their annual support fees. Clients can remain on their current software release without any required upgrades while receiving premium service including support for customizations at no extra cost. ServiceNow is changing the way people work. With a service-orientation toward the activities, tasks and processes that make up day-to-day work life, we help the modern enterprise transform the delivery and management of services. ServiceNow provides service management for every department in the enterprise including IT, human resources, facilities, field service and more.